The product has been added to your shopping cart! Father’s Day is a great time to explore the role of fashion in father–son relationships. It is often timeless yet modern looks that bring the generations together, as well as the courage to experiment. 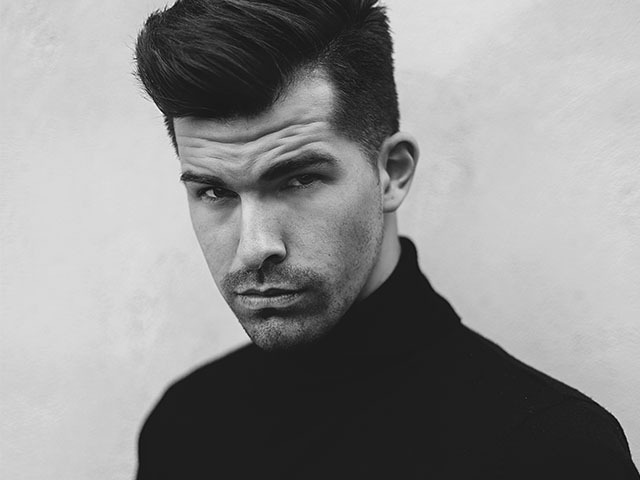 Together with our guest author and style expert Dominik H. Müller, we are taking a look at the fashion parallels between fathers and sons and offering a few styling tips for men of all ages. One of the most important people in a man’s life is his father. He is a role model, adviser and sometimes a rival. Ideally (and usually when the son reaches adulthood), he is also a friend. Fathers undoubtedly influence their sons’ sense of style to varying degrees, whether consciously or subconsciously. Fashion can be a shared interest in father–son relationships, provided that they also share similar tastes. „My dad is not just a dad, but also a good friend. Just as I can talk openly with him about other things in my life, he is open-minded when it comes to fashion sense,” says Müller, describing the relationship with his father and their shared interest in fashion. Mature consumers have changed over the years. They now take a greater interest in fashion, and the clothes chosen by style-conscious men of 60 or thereabouts are not necessarily any different to those of younger generations. At the same time, many young men value a classic style that is both contemporary and ageless. As a result, many items work well at any age: understated sandals, clean-cut sneakers, plain Bermuda shorts, casual shirts, checked patterns ... In fact, there is a long list of things that both father and son can wear. What’s more, men of different generations are exposed to the same trends, as they come and go – and come back again in modified form. This makes it possible for both fathers and sons to fall in love with similar clothes and pair them with a stylish classic, such as boat shoes. Fashion sense is also becoming more daring, with young and “old” alike opting for flamboyant colors and combinations. "My dad often wears color-coordinated outfits, such as socks or shoes that match the color of his shirt." That explains fashionista Müller, revealing one of his dad’s key fashion rules. 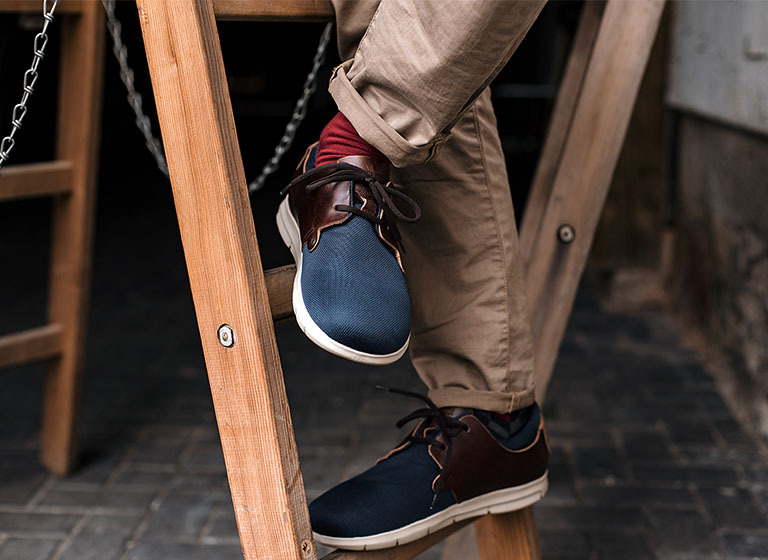 How about combining the Minot sneaker in blue/brown with red socks, beige chinos and a blue shirt? Looks good! Bright socks also work well with sandals. "Be bold and daring when it comes to styling!" 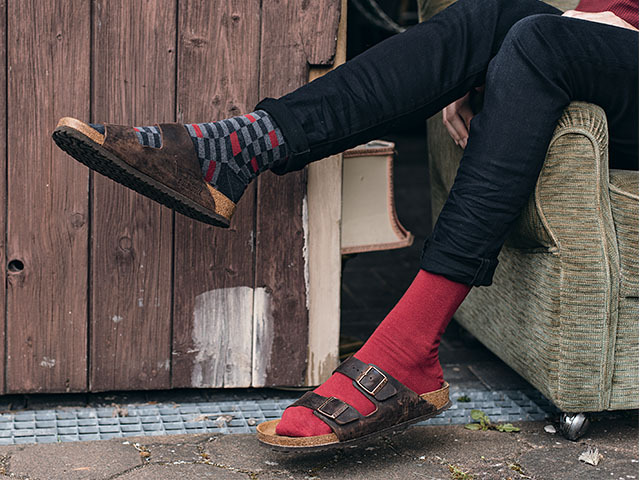 The young style expert advises all men to “be bold and daring when it comes to styling!” Knee-length socks – like the ones your granddad used to wear – are all the rage in 2017 and can be teamed with shorts and a shirt, or a polo shirt and sandals, by men of all ages. Müller loves to create the look with a brightly colored Arizona. The two-strap sandal forms a color contrast with the knee-length socks, but harmonizes with the outfit as a whole. Born in 1993, he discovered a strong interest in photography at the age of 15. He later began studying at Design Akademie Berlin in 2014. Since then, many actors, singers, and models have found their way in front of his camera, and he is passionate about discovering architecture and landscapes with them. Yes, I would like to subscribe to the BIRKENSTOCK newsletter. I can revoke this consent or unsubscribe from the newsletter at any time. I have read and understand the data privacy statement. Dear customer, this shop only makes deliveries to US. Which shop would you like to visit?